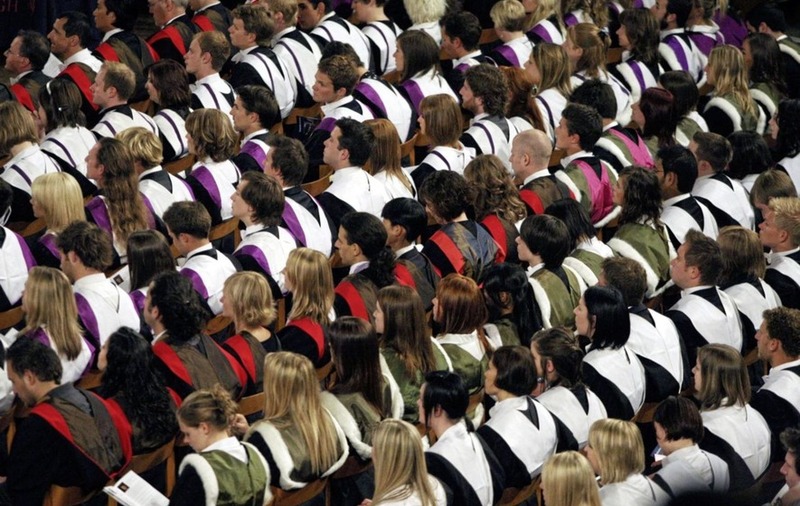 THE number of students accepted on to university degree courses has fallen by two per cent on last year, new figures show. Latest Ucas data reveals that a day after A-level results were published, 430,060 students - from Britain and Northern Ireland and overseas - have had places confirmed. The statistics show that 15,160 have found places through `clearing', the annual process that matches students without places to courses that have vacancies. This includes students who had choices confirmed before Thursday, such as Scottish students and those who took other qualifications to A-levels. In total, around half of those placed through clearing were accepted in the last 24 hours. The overall numbers placed through clearing are up around 2.4 per cent on this point last year. Law, languages, engineering, astrophysics, maths and English are among the subjects with availability, amid intense competition between universities to attract candidates. The Ucas data also shows that England, Scotland and Wales have all seen a fall in the total proportion of students accepted on to courses, while in Northern Ireland numbers are unchanged. The number of EU students taking up places has risen by three per cent, while international students (from countries outside the EU) have increased by four per cent. In Northern Ireland, 28.1 per cent of the 18 year old population have been accepted through Ucas. Ucas chief executive Clare Marchant said there was an increase in the proportion of young people placed from disadvantaged backgrounds. "However, the continuing gap between the most and least advantaged is frustrating, and we'll keep on working with universities to help them evaluate their outreach activities to impact the most disadvantaged students," she said. "The encouraging growth in international students choosing to study in the UK is testament to the welcome of our world class universities. "I'd advise anyone thinking about securing a place through clearing to take some time to visit universities and colleges in the next few days. This weekend's open days are listed on the Ucas website. Seeing everything in person can help you make the right decision." Around 30,000 pupils in the north received A-level and AS results on Thursday. Boys outperformed girls at the A* grade for the first time while the performance gap between the genders also narrowed at the A*-A grade boundary. There was a small increase in those awarded the top grade, with just under a tenth earning an A*. The number of A-level entries declined this year by 5.8 per cent, in line with demographics.